The Echo seniors are left to right Ryan Ramos, Micah Danner and Andy McFarlane. 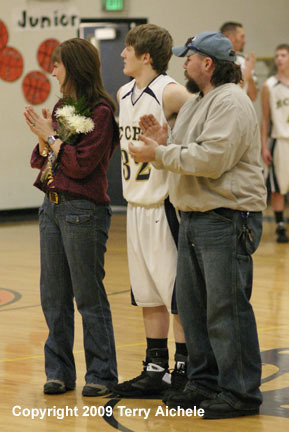 ECHO - The Echo Cougars defeated Crook County Central Christian White Tigers 60 to 55 on Saturday, February 14, 2009. It was senior day for Ryan Ramos, Micah Danner, and Andy McFarlane. The Cougars just outshot the White Knights 36% to 34% for the game. 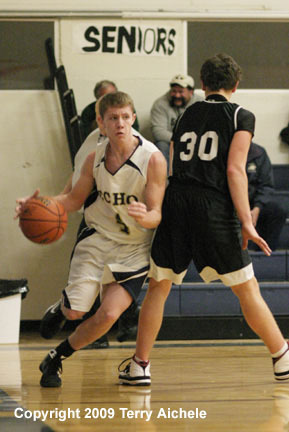 High scorer for the game was Aaron Phillips of the White Knights with 25 points. 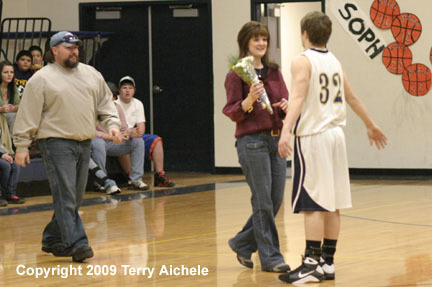 Top scorer for the Cougars was Andy McFarlane. Ryan Ramos had 12, Jorge Munoz had 11, Colter MMcCallum had 9 and Emmanuel Munoz had 4. Echo took the early lead 4-0 in the opening two minutes of the game. The White Knights chipped away at the lead with scoring by Cody Wood, Aaron Phillips, and Kyle Wood hitting shots moving to a 7-6 lead over the Cougars. The White Knights pulled away to as many as much at six points with a minute to go in the period. Central led 17-13 at the end of th period. Echo was held at 13 for the first three minutes of the second period while the White Knights stretched the lead to 12, 25 to 13. That was a turning point for the Cougars as they started scoring with McFarlane, Ramos, and Jorge Munoz hitting shots and freethrows. Echo clawed their way back to being down by three at halftime, 31 to 28. The scrappy Cougars gained the lead in the third period partly by holding the White Knights to just two points over the last three minutes of the period. 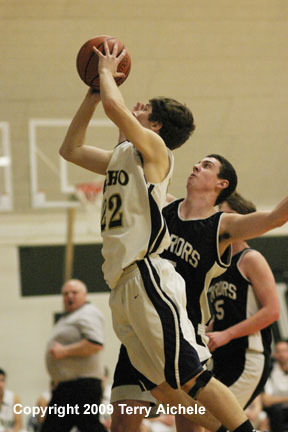 The usual Cougars scored throughout the period which ended with Echo leading 44 to 42. 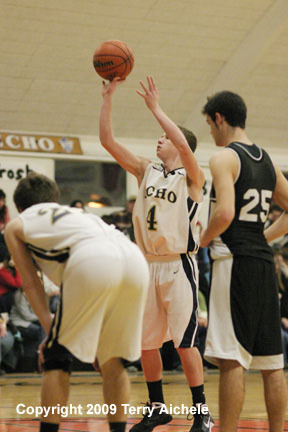 Echo continued to control the play in the fourth period with a lead of four to five points most of the time. Cougs scoring in the fourth included McFarlane, Ramos, Jorge Munoz and Ryan Ramos. Echo won 60 to 55. 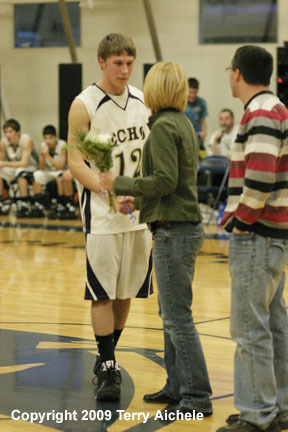 LEFT - Echo senior Ryan Ramos with his parents. 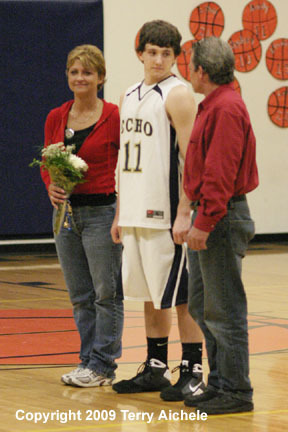 RIGHT - Echo senior Andy McFarlane with his parents. 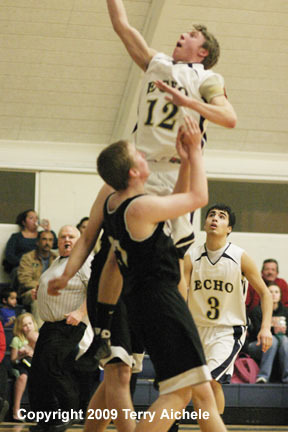 LEFT - Emmanuel Munoz of Echo drives to the basket for a layup. 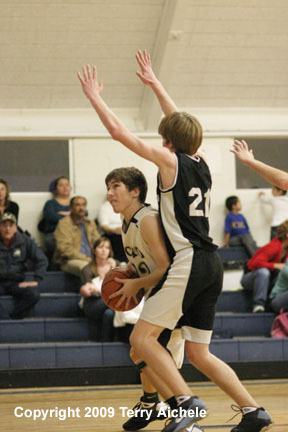 RIGHT - Cougar Colter McCallum works his way to the basket while being closely guarded by Cody Wood of the White Knights. 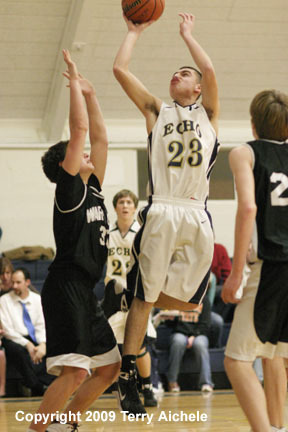 LEFT - Glenn Swanger of Echo shoots a freethrow. RIGHT - Ray Harris of Echo with the ball. LEFT - Bryan Ibarra of Echo shooting a jump shot. 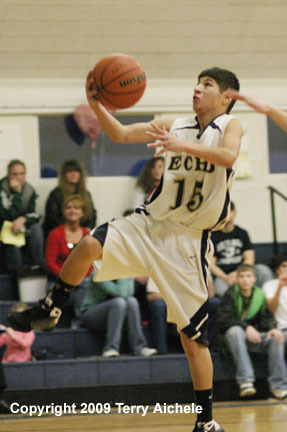 RIGHT - Echo senior Ryan Ramos shoots a jumper. 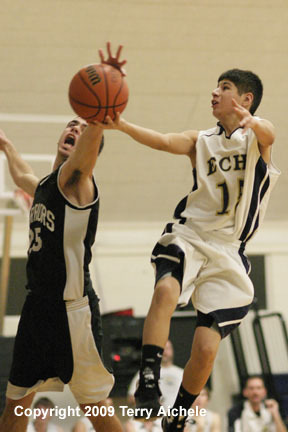 LEFT - Ryan Ramos drives to the basket with a layup. 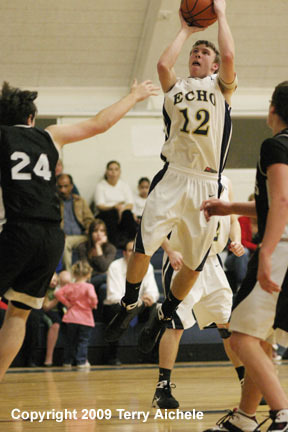 RIGHT - Emmanuel Munoz of Echo drives to the basket with a layup.